Once again, we find newsboy caps in nefarious surroundings — note the presence of a slot machine in the background. 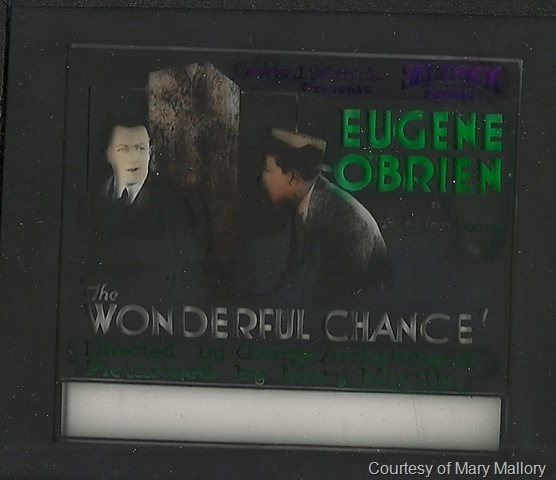 Mary Mallory sends along a glass slide from her collection. Thanks, Mary! This is “The Wonderful Chance.” Well, sort of. These clips appear in a Vitaphone comic short titled “The Nicklette,” along with newsreel footage, poking fun at the days of silent films. The narrator identifies Rudolph Valentino and Eugene O’Brien … but our mystery woman is identified in the narration as Elaine Hammerstein. Mary Mallory, Mike Hawks and Patrick tell me she is Martha Mansfield. Prints of the entire movie apparently exist at the George Eastman House and the Museum of Modern Art. And for Tuesday, our mystery chap has some mysterious companions. (Warning: IMDB may not be much help here). Please congratulate Mary Mallory and Mike Hawks for identifying the mystery film and actor. And congratulate Eve Golden, Suzanne Annette Stone, Tim Doherty, Floyd Thursby, Don Danard, Jenny M., Patrick (right actor, wrong movie), Bob Hansen and Rick Scott for identifying our mystery chap. And for Wednesday, a mystery woman! Please congratulate Dewey Webb for identifying Monday’s mystery chap. And for Thursday, another mystery chap. Please congratulate Mike Hawks and Mary Mallory for identifying yesterday’s mystery woman and Herb Nichols for identifying the mystery fellow in the newsboy cap. And for Friday, the mystery woman and a mystery fellow. Please congratulate Patrick for identifying our mystery film. Mary Mallory and Mike Hawks identified Thursday’s mystery chap and Bob Levinson and Donna identified our mysterious fellow in the newsboy cap. This entry was posted in Fashion, Film, Hollywood, Mystery Photo and tagged #Newsboy caps, film, hollywood, movies, mystery photo. Bookmark the permalink. Is that the late Rudolph Valentino in the center? To me, it looks a little like Rudolph Valentino but what’s he doing wearing a newboys cap? Rudolph Valentino in THE WONDERFUL CHANCE 1920. I’ve been taking a closer look at Monday’s Mystery Photo and I believe the fellow to Rudy’s right (also wearing a newsboy cap) is Steve Murphy. Murphy also made films with Chaplin and Keaton in the 20’s. The photo isn’t quite clear enough to make out Murphy’s magnificently broken nose, but I’m pretty sure that’s him. So, I’m going to take a shot in the dark and say the film is The Four Horsemen of the Apocalypse from 1921. Sessue Hayakawa in The Cheat. It’s Rudolph Valentino, looking shifty. It probably isn’t…but it looks alot like Rudolph Valentine behind the “stach. I have an equally bad guess if this is wrong. Did I not submit my comment properly? It’s still awaiting moderation? Just wondering..
Oop, serves me right responding at 7AM…Rudolph Valentino. Luckily, you knew who I meant. It’s Johnny Arthur! I don’t know what movie this is, but I remember him as Darla Hood’s father from “Our Gang”. this is Martha Mansfield with Rudy. Eugene O’Brien today in one of his roles. Wednesday’s mystery woman appears to be Martha Mansfield. She was in yet another movie called Broadway Bill (unrelated to the two we have seen here). Thursday would be Eugene O’Brien who made Rebbeca of Sunnybrook Farm with Mary Pickford. That would make this weeks film The Wonderful Chance from 1920. Our man thursday is Eugene O’Brien. Taking a really wild stab due to the percieved age of film: “The Musketeers of Pig Alley”. I cannot even guess who the performers are.